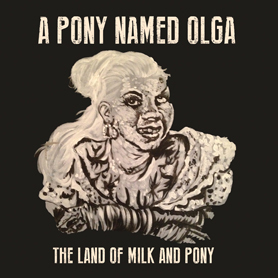 A Pony Named Olga is already a familiar name around Europe where they've played hundreds of shows over the past several years in Germany, Italy, Switzerland, Austria and Portugal. Now, Saustex has repackaged and re-issued their debut album “The Land Of Milk And Pony”, making it available for the first time in the U.S. (And the first time on vinyl!) The Berliners arrive with a jazzed up take on cowpunk that blends polka, big beat, rockabilly and rock. Lyrically biting and wryly comedic, they avoid the linguistic pitfalls of many German bands that sing in English. Lead vocalist Heinrich Heimpel has a high, throaty timbre -- perhaps reminding of a modern-day male equivalent to Wanda Jackson. He's no slouch on his Gretsch six-string either, seamlessly blending a wide variety of styles with panache. Bassist "Luscious" Lloyd Clark slaps with class and high showmanship while drummer Steve The Machine lives up to his name. 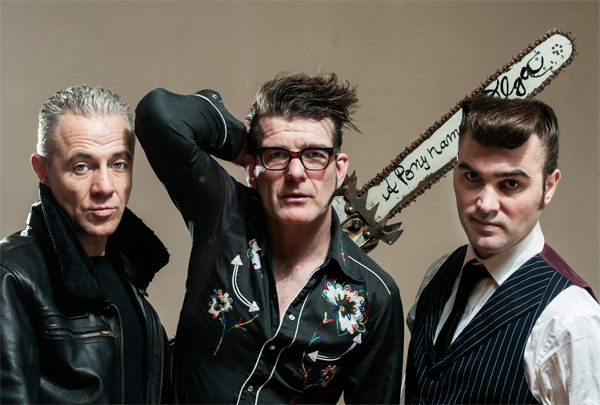 This is musically deft psychobilly that's the soundtrack for any roots rocking party. Their explosive live shows and hectic international touring schedule which now includes the U.S. make them a band to watch.